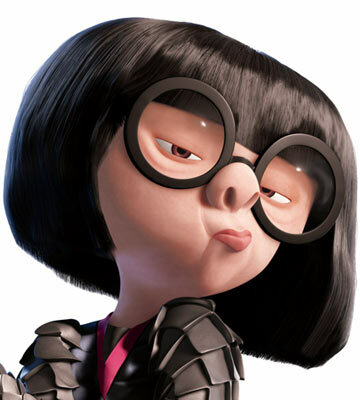 Edna Mode is a world-renowned fashion designer...but she's also a secretly-renowned (within the super community) costume designer for superheroes, having designed many, if not most, of the superheroes costumes during the first great age of supers. Edna is an overpowering personality; she's even bolder than her designs, and speaks her mind bluntly. She's also extremely persuasive. She relishes a challenge and aspires to be the very best at what she does. Edna greatly misses the old days of designing for supers. "I never look back, it distracts from the now." "I used to design for GODS!" Edna Mode is not just a designer for supers, she assures their well-being with appropriate costumes designed to withstand extreme punishment (including fire, bullets, missiles, you name it). But perhaps moreover she knows how to motivate her superhero friends and assist them in their path, sometimes with subtlety but often with a strange combination of brute force of personality and charm.